Leading the 'green race'. 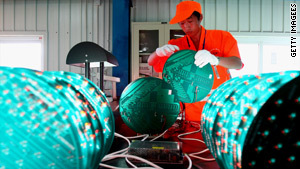 Many think China has the potential to lead the rest of the world in green technology. Problems may be substantial, but many think China could lead the "green race"
(CNN) -- Could China be the world's green champion? It seems unlikely. The vast nation is typically portrayed as a dire threat to the planet, with a booming population and a commitment to that dirtiest of fuels -- coal. But all that might be about to change. In a column in the New York Times in September headlined "The New Sputnik" Marshall Scholar and multi-Pulitzer Prize winning author Thomas Friedman argued that not only was China going green, but that the decision would spark change around the world -- particularly in the U.S. - much as the USSR's decision to launch Sputnik turbo-charged the space race in 1957. "China's leaders have decided to go green," he wrote. "...too many of their people can't breathe, can't swim, can't fish, can't farm and can't drink thanks to pollution from its coal- and oil-based manufacturing growth engine. And, therefore, unless China powers its development with cleaner energy systems, and more knowledge-intensive businesses without smokestacks, China will die of its own development." The column sparked a fury of debate. In the UK, the Guardian's Jonathan Watts accused him of spending "too long sipping tea with Dalian's technocrats and not enough time breathing the air in Shanxi, Henan and Beijing." After all, despite impressive investments in green energy, China still depends on coal for 70 percent of its power, rapid industrialization and booming car ownership has cast a pall of smog over many cities and according to the U.S. Energy Information Administration, the country's carbon emissions are now greater than the United States, and are set to keep rising. But now a major new report has stirred the mix further. Produced by an international task force and presented to the Chinese government last month, "China's Pathway Towards a Low Carbon Economy" (CPTLCE) presents a clear plan showing how the country can make the switch from red to green. It can do this, the report suggests, by evolving its economic development model, adjusting its economic structure, enhancing its technological innovation capacity and strengthening the sustainability of its economy. The problems may be substantial but, CPTLCE argues, the way ahead is clear. But can China be the leader the world needs? "If we are talking about green technologies, then I think the answer is definitely 'yes'," the report's co-chair Bjorn Stigson, President of the World Business Council for Sustainable Development, told CNN. Like Friedman, he believes a green transformation in the country is inevitable. "In my meetings with Chinese political leaders, including PM Wen Jiabao, I heard very clear signals that this is a priority issue. The Chinese leadership is committed to refocusing attention on environmental protection, water preservation and developing world-leading technologies," he says. "Given population growth, urbanization and a focus on poverty alleviation among emerging economies, we can foresee that the future world will be resource- and carbon-constrained. China will suffer negative impacts from climate change as well as from resource constraints, unless the world -- and that includes China -- gets onto a low carbon development path. "In the past China has given priority to economic growth over environmental protection. This has led to air, water and soil pollution. However, recently the leadership has realized this and is taking serious action to address this imbalance." In particular, Stigson believes that China's position as the world's factory puts it in a strong position as a technological innovator. "[China] can be a leader on the technologies that will be required to deliver green energy: solar, wind, bio-fuels and clean coal," he says. "Furthermore, as China is going through rapid industrialization, they have a chance to install some of the best available technologies in their industries." It seems those in the West keen to cast China as an environmental villain could be guilty of a fair degree of hypocrisy -- and may need to look a little closer to home. "Currently American emissions of greenhouse gas are over 20 tonnes per person, while in China personal carbon footprints are one fifth of that, and 238 million people live below the poverty line," Friends of the Earth's international climate coordinator, Joe Zacune, told CNN. "Meanwhile, personal carbon footprints in the UK are twice that of China, yet China has a higher proportion of renewable energy for electricity than the UK. "China does have the potential to be a world leader on environmental issues. Domestically, China has been investing in renewable energy and should continue such steps by expanding investment in appropriate, community-led renewable energy rather than coal and other dirty fossil fuels. "China seems to be showing much more political will than the U.S. as well as other Annex-1 [rich, industrialized] countries, both domestically and internationally... The primary obstacle for China being a green leader is the lack of a strong example by those countries which are historically responsible causing climate change. "China's moves to promote clean energy could indeed highlight the lack of action by the U.S. China should most certainly not attempt to follow the U.S.' disastrous 'cap and trade'." Zacune also believes that China's position outside the Annex 1 group of rich countries identified by the Kyoto Treaty is politically interesting -- giving it a chance to act as a champion for other developing nations at the climate talks currently on in Copenhagen and hold the U.S. and Europe to account. But, in the end, it may be the fear of being left behind that drives change in the West -- and East. "The move towards a low carbon economy, not least in China, is triggering a positive race between countries," says Stigson. "The USA has realized that both China and the EU are putting in place serious policies to take the lead on this issue. "The 'green race' is on, and may the best man win."